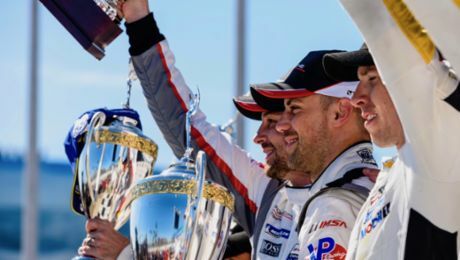 The 911 RSR with the starting number 912, driven by two-time overall Le Mans winner Earl Bamber, Laurens Vanthoor and Gianmaria Bruni, finished sixth in the strongly supported GTLM class at the 24 Hours of Daytona. Fifty years after Porsche’s first overall victory at the 24 Hours of Daytona, the Porsche GT Team fielded two 911 RSR this weekend at the long distance classic in Florida. The racer with the starting number 912, driven by two-time overall Le Mans winner Earl Bamber (New Zealand), Laurens Vanthoor (Belgium) and Gianmaria Bruni (Italy), finished sixth in the strongly supported GTLM class. The second 911 RSR with the starting number 911, in which Patrick Pilet (France), Nick Tandy (Great Britain) and Frédéric Makowiecki (France) led the field at one point in the first third of the race, took the flag in eighth. Two pit stops for repairs after leaving the track in the Bus Stop chicane hampered a top result. The race for the #912 Porsche 911 RSR, shared by Earl Bamber, Laurens Vanthoor and Gianmaria Bruni, ran without issues. The trio made no major mistakes, however they were unable to match the pace of the frontrunners over the distance. In addition, the caution phases at this year’s Daytona race were few and far between, making it impossible to close the gap to the leaders behind the safety car. Especially in the USA, the race director uses this method after incidents on the track to herd the field together and thus keep suspense high. This year, however, there were only four caution phases compared to 21 in 2017. Drivers and teams have completed three quarters of the distance at the 24 Hours of Daytona, the traditional season-opener of the IMSA SportsCar Championship and the North American Endurance Cup. On Sunday morning, the best Porsche 911 RSR with the starting number 912 is running in fifth place in the GTLM class. Sharing the cockpit is the two-time outright Le Mans winner Earl Bamber as well as Laurens Vanthoor and Gianmaria Bruni. 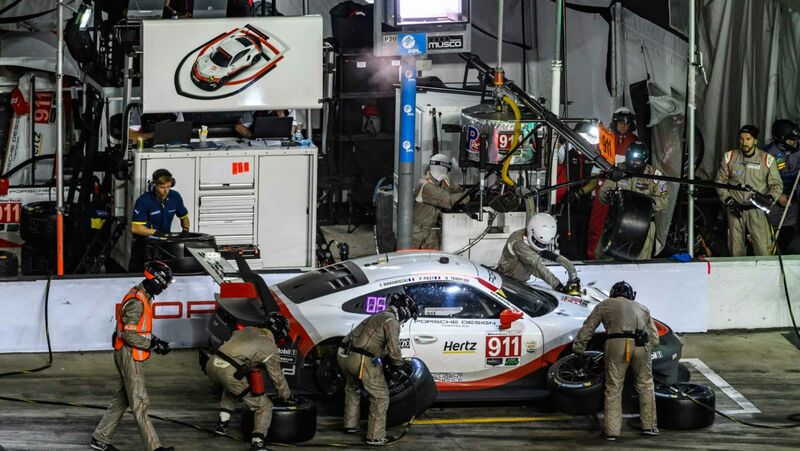 The Porsche GT Team’s second 911 RSR with the starting number 911, driven by Patrick Pilet and his teammates Nick Tandy and Frédéric Makowiecki, had taken the lead of the strongly represented GT field late on Saturday evening but fell back to eighth place during the night. 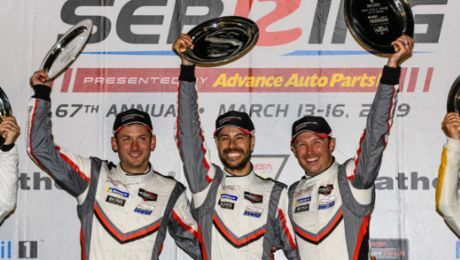 After eight hours and 293 laps of the spectacular long distance classic in Florida, the Porsche GT Team had to finally give up hope of claiming the 78th class win. Nick Tandy, the 2015 Le Mans overall winner, lost control of his 911 RSR in the Bus Stop chicane, slid at high speed over the green strip, which was still damp after a shower, and crashed into a stack of tyres. His racer was so badly damaged that it had to be pushed straight into the workshop for repairs after returning to the pits. The crew of mechanics immediately set to work and managed to get Tandy back on the track after 20 minutes. Because of this incident, he lost 13 laps to the class leader and was relegated from fourth to eighth. Another crash at the same spot during the night cost more valuable time. At the wheel of the #911 Porsche, Patrick Pilet, Nick Tandy and Frédéric Makowiecki at times held the lead of the GTLM class. With five manufacturers contesting this category it is the most strongly supported. After the first third of the race and 261 laps, the trio ranks fifth. Their teammates Earl Bamber, Laurens Vanthoor and Gianmaria Bruni currently hold seventh position with the #912 car. At the 5.729-kilometre Daytona International Speedway, an ultra-modern motorsport arena with two fast banked turns and a tight infield, the race cars from Weissach took up the legendary long distance classic in Florida from the second grid row. Facing stiff competition from BMW, Chevrolet, Ferrari and Ford, they managed to build on their strong qualifying performance and maintain contact with the front-runners. After a brief downpour five hours into the race, the Porsche pilots did not change to wet tyres, unlike most of their rivals. Despite their slower lap times, they were spared two pit stops for tyre changes. Thanks to this strategy and his remarkable performance on slicks on the slowly drying circuit, Patrick Pilet moved into the lead after six hours for the first time in this race. 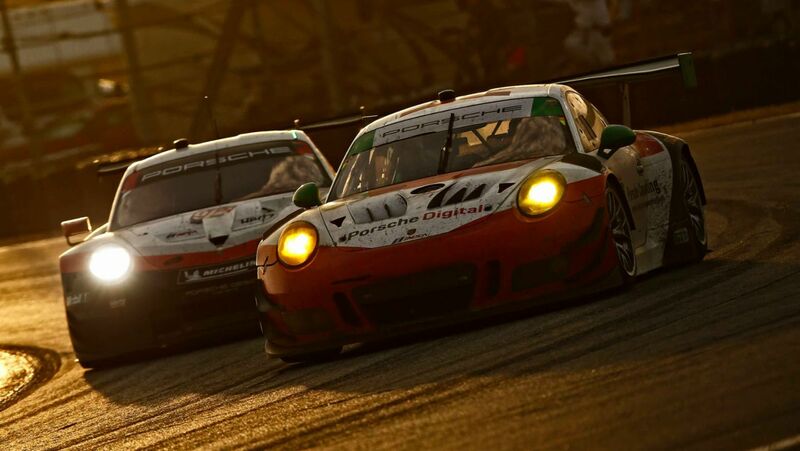 Both Porsche 911 RSR cars took off into the Daytona 24-hour race without any problems. The race cars from Weissach, which celebrated their race debut at the Daytona International Speedway a year ago, face strong opposition in the traditionally cutthroat GTLM class. After the first hour of racing, the 911 RSR with the starting number 911, shared by Patrick Pilet, Nick Tandy and Frédéric Makowiecki ranks fifth. 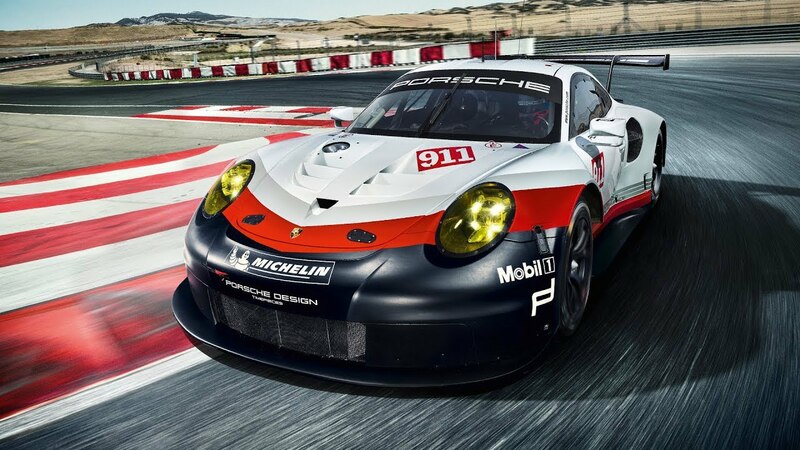 The second 911 RSR (#912) fielded by the Porsche GT Team at the season-opening round of the IMSA SportsCar Championship and the North American Endurance Cup currently lies sixth. This car is driven by Laurens Vanthoor, Earl Bamber and Gianmaria Bruni. A total of 50 vehicles started the 56th edition of the long distance classic in Florida at 14.40 hours. With 22 overall wins and 77 class victories, Porsche is the most successful manufacturer in the history of this race. Round two of the IMSA SportsCar Championship is the 12-hour race in Sebring on 17 March in the US state of Florida. The IMSA SportsCar Championship is a sports car race series contested in the USA and Canada, which was run in 2014 for the first time. The series was formed from the merger of the American Le Mans Series and the Grand-Am Series. Sports prototypes and sports cars start in three different classes: GTLM (GT Le Mans), GTD (GT Daytona) and P (Prototype). The Porsche 911 RSR runs in the GTLM class, with the Porsche 911 GT3 R contesting the GTD class.